The appearance of a galaxy can depend strongly on the color of the light with which it is viewed. The Hubble Heritage image of NGC 6782 illustrates a pronounced example of this effect. This spiral galaxy, when seen in visible light, exhibits tightly wound spiral arms that give it a pinwheel shape similar to that of many other spirals. However, when the galaxy is viewed in ultraviolet light with NASA's Hubble Space Telescope, its shape is startlingly different. Ultraviolet light has a shorter wavelength than ordinary visible light, and is emitted from stars that are much hotter than the Sun. At ultraviolet wavelengths, which are rendered as blue in the Hubble image, NGC 6782 shows a spectacular, nearly circular bright ring surrounding its nucleus. The ring marks the presence of many recently formed hot stars. Two faint, dusty spiral arms emerge from the outer edge of the blue ring and are seen silhouetted against the golden light of older and fainter stars. A scattering of blue stars at the outer edge of NGC 6782 in the shape of two dim spiral arms shows that some star formation is occurring there too. The inner ring surrounds a small central bulge and a bar of stars, dust, and gas. This ring is itself part of a larger dim bar that ends in these two outer spiral arms. Astronomers are trying to understand the relationship between the star formation seen in the ultraviolet light and how the bars may help localize the star formation into a ring. 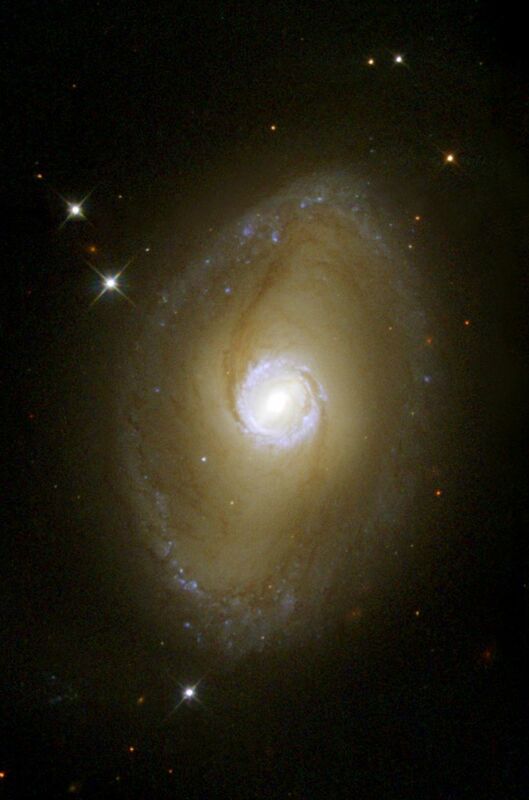 NGC 6782 is a relatively nearby galaxy, residing about 183 million light-years from Earth. The light from galaxies at much larger distances is stretched to longer, redder wavelengths ["redshifted"], due to the expansion of the universe. This means that if astronomers want to compare visible-light images of very distant galaxies with galaxies in our own neighborhood, they should use ultraviolet images of the nearby ones. Astronomers find that the distant galaxies tend to have different structures than nearby ones, even when they use the correct procedure of comparing visible light in distant galaxies with ultraviolet light from nearby ones. Since the distant galaxies are seen as they were billions of years ago, such observations are evidence that galaxies evolve with time. The Hubble image of NGC 6782 was taken with the Wide Field Planetary Camera 2 (WFPC2) as part of an ultraviolet survey of 37 nearby galaxies. The observations were carried out by an international "Hubble mid-UV team" led by Dr. Rogier Windhorst of Arizona State University. Additional observations of NGC 6782 were made by the Hubble Heritage Team. The color image was produced by combining data from both observing programs that were taken through color filters in the WFPC2 camera that isolated ultraviolet, blue, visible, and infrared light.